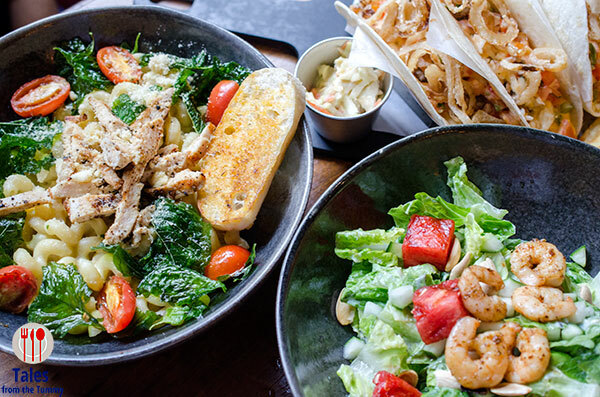 Applebee’s, a popular franchise from the USA, recently added a host of new items to their menu focused on adding local flavors. Applebee’s is a great place to celebrate everything, both the usual and the special moments, with their menu that caters to all ages and food preferences. We got a chance to sample some of the new dishes and here’s what we thought of them. Fried Spicy and Sweet Pickles (P195). Irene and I are hooked on fried pickles after getting to try it recently, although each one tastes a little different. 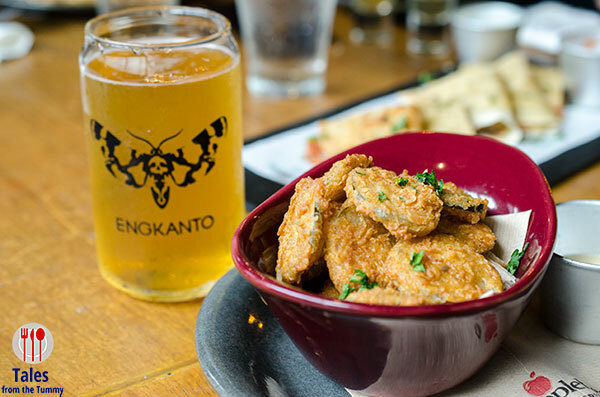 Applebees’ version has a bit more spiciness that goes well with the light batter and a glass of Engkanto beer on tap. Two variants are available, the Lager and the Pale Ale. Other appetizers you can pair with your Engkanto beer or drink of your preference are the Southern Beef Brisket Quesadilla (P525), Bacon Jalapeno Potato Croquettes (P265), and BBQ Beef Brisket Tacos (P545). I never say no to potatoes in whatever form so the croquettes delight me, crunchy outside and soft inside plus bacon bits. If you don’t like spicy food then just skip a dip in the sauce. The Beef brisket quesadilla is very meaty and flavorful with the bright lime salsa providing a good foil. The bbq beef tacos are technically not listed in the appetizer part of the menu but it’s easily sharable. Got to sample 2 new salads, Grilled Watermelon and Spicy Shrimp Salad (P765/full, P445/half) and Buffalo Chicken Salad (P525/full, P325/half). Of the two, our favorite is the watermelon salad, the grilling gives the fruit an even sweeter taste plus a smoky aroma. The spicy shrimps are also grilled to give it a nice spicy kick but balanced out by the mint yogurt dressing. The buffalo chicken salad has Romaine lettuce, blue cheese dressing, and topped with buffalo chicken tenders, ok but not really memorable. Fiesta Pork BBQ Liempo (P495). My favorite fiesta lime chicken gets a porky counterpart. 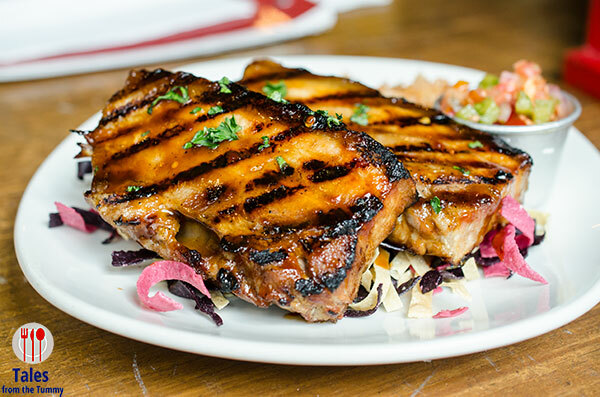 Two grilled pork belly steaks are basted with an Asian bbq sauce to give it a sweet and savory flavor combination. Served with the fun, colored tortilla strips, pico de gallo and Applebee’s Mexi-rice. Pork Liempo Adobo (P485). 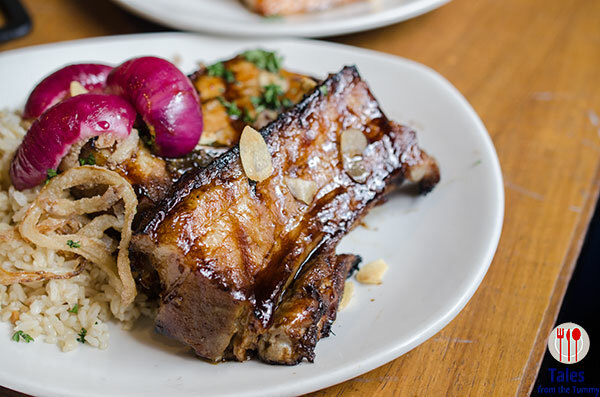 This pork belly dish is basted with a soy vinegar sauce for a more familiar local flavor. Topped with garlic chips, fried onions and a side of garlic almond fried rice. I still prefer the first bbq over this one because I can’t resist those colored tortilla strips. Firecracker Shrimp (P595). 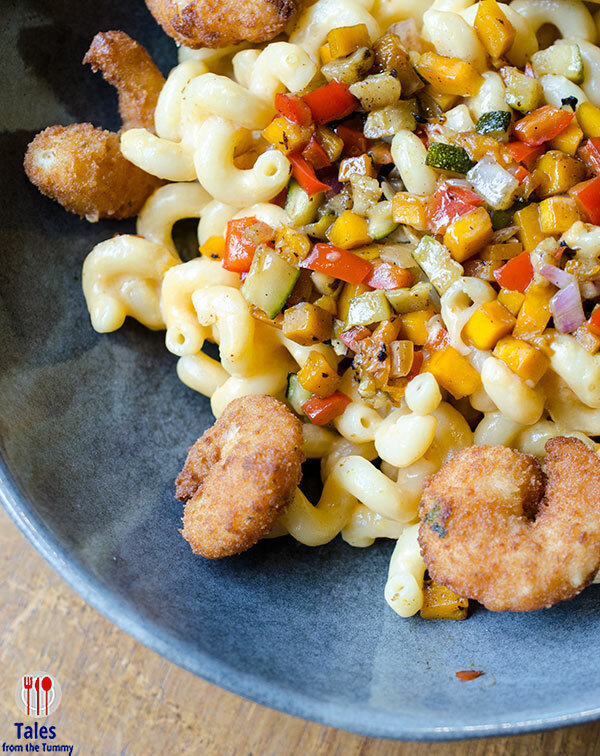 Cavatappi pasta tossed in Sriracha Parmesan cream sauce topped with grilled vegetable relish and crispy breaded shrimps. We found the spiciness just right, enticing your taste buds to have more but not numbing their ability to enjoy the flavors. I felt the grilled vegetables added a nice smoky aroma as well as tempered the spiciness. The crispy shrimps are bonus additions for crispy sweet seafood flavor and also added a contrasting crunch. 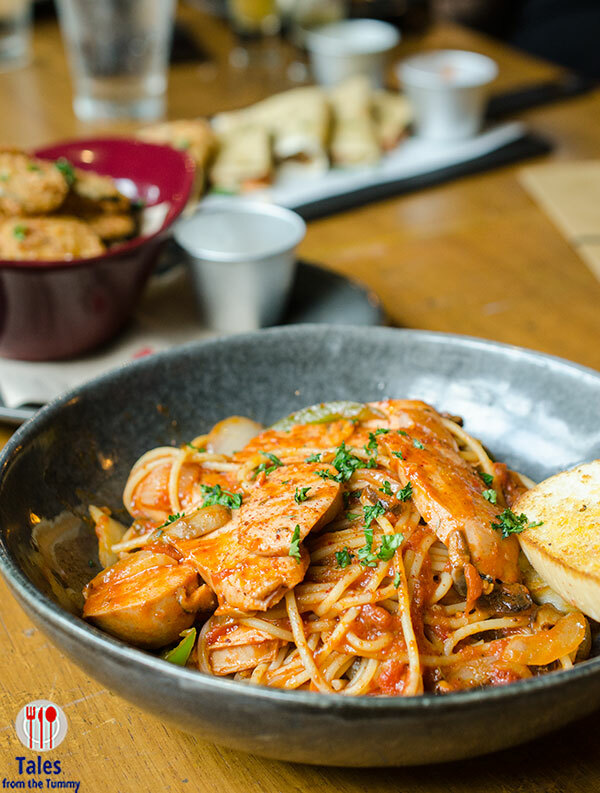 Grilled Sausage Marinara Pasta (P495). A marinara sauced pasta base with added assorted mushrooms, sun-dried tomatoes, bell peppers and grilled Schueblig sausages. Triple Meat All In Burger (P795). If you love meat then this burger will have you salivating. 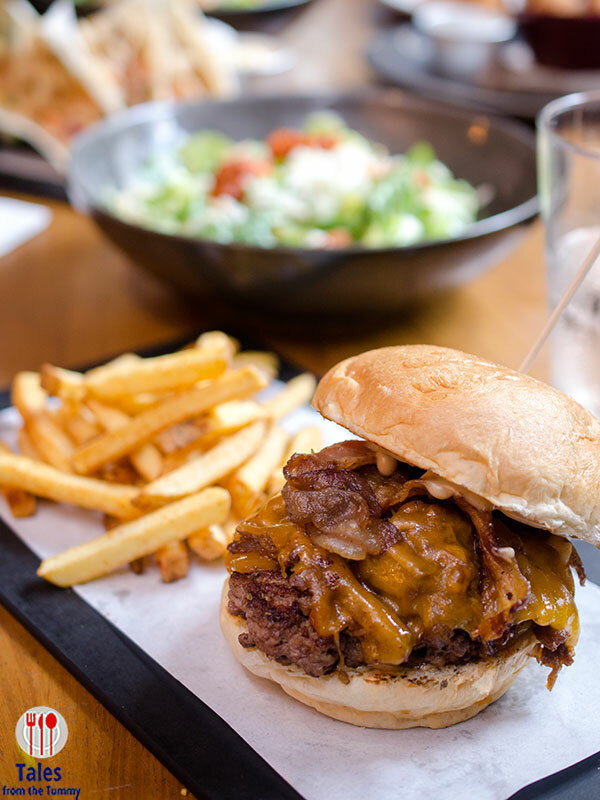 A brioche bun holds a USDA beef burger patty then they add double smoked bacon, and shredded honey bbq beef brisket and cheddar cheese, served with a side of seasoned fries. Middling appetites should not even attempt this one. 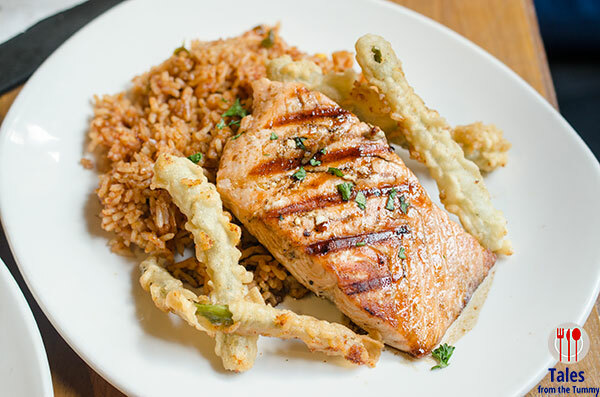 Teriyaki Balsamic Glazed Salmon (P675). For those looking for something lighter, the perfectly cooked salmon should fit the criteria. Norwegian pink salmon fillet basted with teriyaki balsamic sauce for a bit of sweet and savory flavors. Served with Mexi-rice and green bean crispers on the side.